There are very few people who will deny that a Greyhound is a beautiful animal. They have been the dog of royalty and the chosen subject of art for centuries. Their regal, stylized form has become synonymous with the image of status and elegance. Even if the sighthound build isn't your preference, there is nothing quite like watching them run and I think most any dog lover will admit to that. Truly, they are the supermodels of the dog world: tall, leggy, graceful, low percentage of body fat...well, if that supermodel also sidelined as an Olympic sprinter. I have never shared my home with a Greyhound, though I've been an admirer since I first became aware of them. I am an online stalker of my many Greyhound friends, mulling over their photos of their beautiful dogs and I read the bios of the adoptable dogs from the many adoption groups and sigh. Someday, there will be a Greyhound (or two) on my couch, but at this time in my life they would not fit into my lifestyle, or my pack of very high energy dogs. 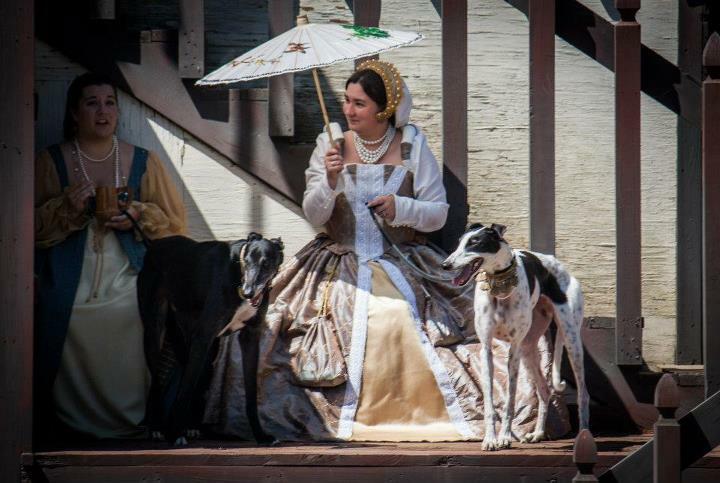 Taking that into consideration, I leaped at the chance to spend a weekend with The Hounds of East Fairhaven, a group that promotes Greyhound education and adoption at Renaissance Festivals. 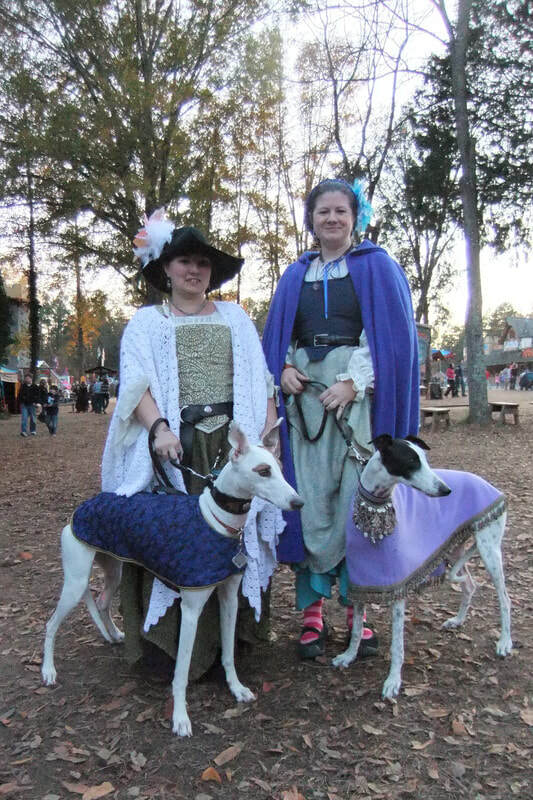 I was able to spend the weekend playing dress up in good company, surrounded by wonderful dogs! These dogs were amazing ambassadors in every way. They were friendly and relaxed even in the middle of extreme chaos: huge crowds, camels, horses, loud music, people wearing masks and wild clothes, gun shots...they weren't phased. Which brings me to Lorelei, a young "racing school drop out" who preferred to sniff the roses rather than race. Lorelei belongs to my friend, Shannon, and she was "loaned" to me for the festival. Lorelei is a very beautiful, sweet girl who I've loved from afar for years; she is simply adorable from her sweet little tipped ears to the tiny curl in her tail. 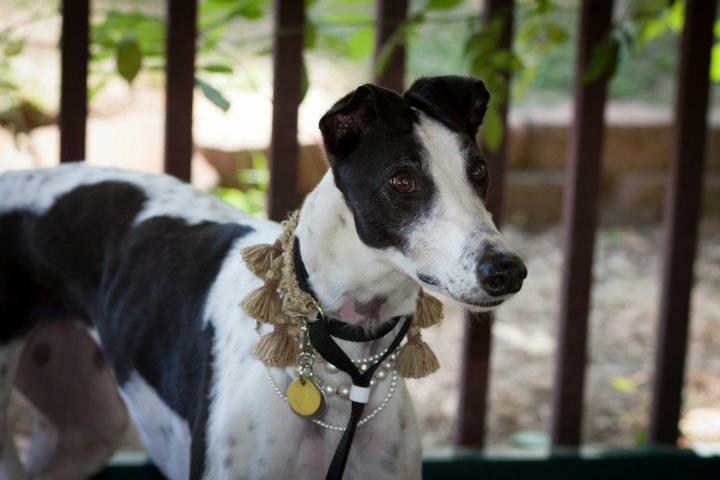 It is rumored that she may not be the very brightest of Greyhounds, as her head is filled with cotton candy clouds and sparkly stars, but she is simply brilliant in terms of empathic connection with people. Simply put, she loves everyone unreservedly. She enthusiastically approached every new person all weekend long, untiringly offering herself for pets and leans and winning new admirers, big and small. At one point, while walking through the milling crowds with hands reaching for her every few steps, we were stopped by a family with a small girl who wanted to see her and her "sister", Delilah. The mother warned that the child had a sensory issue that made it difficult to perceive the strength of her grip. For the next few moments, she hugged Lorelei a little too tight, patted her a little too hard, and Lorelei stood quietly and enjoyed every second of it. The child was delighted! However, later in the day, Lorelei did something that was truly touching. A very elderly woman came to visit the Hound Barn, being pushed in a wheelchair by her very elderly daughter. The mother was very fragile and infirm, and not all together there, but the sight of the dogs lying quietly in the barn made her sit up a little straighter. Lorelei, who had been lying half-asleep taking a break from her long day, spotted this woman immediately and leaped to her feet instantly and went to greet her. Her steps slowed the closer she came, her head lowered and her whole demeanor softened. By the time she reached the woman, she was moving very gently and carefully. She stopped by her side and lowered her head into the woman's lap and stood very still while the woman took Lorelei's head between her hands and pet her somewhat awkwardly. The woman's whole face just lit up in the most beautiful smile and she began saying, "Oh, you are so pretty! Look at you!" They stayed like that together for quite some time, with the daughter standing by looking on. The daughter was so thrilled, and I could tell that it made the day better for both of them. Lorelei, to me, is a wonderful example of what is truly beautiful about Greyhounds: their empathic, loving personalities. The elegant, sleek form is just the pretty wrapping paper on the true gift!